The time I have spent around Ubuntu has given me a deep appreciation for the finer points of design, branding, themes, and artwork around software development and user interfaces. From Ubuntu's elegant color schemes and meticulously kerned fonts, to the careful placement and balance of Ubuntu's logos and Canonical's brandmarks, Ubuntu exudes an exquisite level of polish and professionalism, particularly among free software projects. With this as a backdrop, I have long wanted to refresh and modernize the logos and branding associated with eCryptfs, as an upstream open source project. 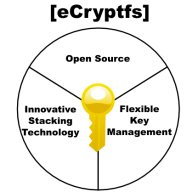 For over six years, the eCryptfs logo has been an ever-so-trite yellow key overlayed on top of a pie chart. Yawn :-o I'm pretty sure that "logo" was pulled off of a slide deck for IBM management, when Michael Halcrow and Emily Ratliff originally presented the idea of eCryptfs back in 2004. So I pitched this idea to my new employer, Gazzang, who, as it turns out, has considerable interest in a healthy eCryptfs community, as it forms the basis for several of our cloud encryption products. Our CEO, Larry, was thrilled by the idea, and gave Heidi (our director of marketing) financial approval to commission the new art from a professional graphic designer. We felt that eCryptfs, as an active and vibrant open source project, deserved a logo and a mascot that reflects just that. Everyone uses a lock or a key to represent encryption, so we thought we'd do something different. We decided we wanted a stylized animal, in the spirit of Linux's Tux, BSD's Daemon, OpenBSD's Puffy, and of course Ubuntu's every growing zoo! And the font is modern, crisp, clean, and perhaps a little "techy" even. The "fs" is highlighted, to note the relationship to the filesystem, as well as help demonstrate the pronunciation of the word -- "ecrypt" and then "fs". Gazzang has contributed all of this artwork to the eCryptfs project under the Creative Commons CC BY-SA 3.0 license. We hope you enjoy it as much as we do :-) Let us know what you think! Now there is one piece we're still missing. We don't yet have a name for our snarling cryptographic honey badger. So we're putting it out to you... Suggestions? Drop us a comment below! It's simple and a bit obvious, but I'd just call him/her "Honey". May I suggest Duncarron (http://en.wikipedia.org/wiki/Duncarron)? Get it, "Done carin'"? OK bad pun, but hey, honey badger don't care. or Randall after the commentator on the linked meme vid. Following the lines of the honey badger Internet meme, what about Randall? I recall slapping that original logo together in Inkscape when I had a half hour between meetings one day. The management at the time could barely tolerate dev work on eCryptfs, let alone shell out for a domain or a professional logo. I think I did use a key icon that I had recently used in a slide deck.